Orden Ogan are back with their third album - "To the end". The German band released their first self produced demo/EP in 2004, then in 2008 released their debut album - "Vale". They signed with AFM records in 2009 then soon after had one of their songs "We are pirates" used by German TV channel RTL in their coverage for the Formula 1 Grand Prix at Monza, gaining the band a huge amount of exposure and new fans. In 2010 they released their second album, "Easton hope". Now two years later it's time for their third album to be released. official ORDEN OGAN record, but since eight years now we never played a concert without having these two songs in our setlist. Of course fans kept asking us how they could get the tracks and so we saw that there was a lot of demand. So when we started working on “To The End” we somehow knew that “Mystic Symphony” and "Angels War” should become part of it. So, here they are". So two of the songs will be familiar to the bands fans who have seen them live, but for the rest of us they're new. Brief comments on a couple of tracks..
"The Things We Believe In" is an excellent track. It's got a great chorus and catchy tune - check out the excellent video below as that way you can see and hear for yourself what it's like. As a track thats made up part of the bands live shows from their early days then I was expecting "Dying paradise" to be good - after all if it wasn't a strong track then it wouldnt have survived for so long in their setlists. As expected it's a great track - it's one of the heaviest and fastest tracks on the album and listening to it I can see why it's in their live shows - this is a track perfectly suited for live performance with lots of power and energy to it. 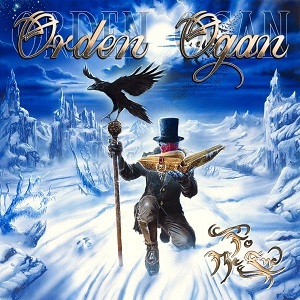 Orden Ogan are a band that may well be a new name to a lot of people but if you're a fan of bands like Blind Guardian then you should definitely check this album out as it's a great album.